‘Never mix business with pleasure’ … I couldn’t disagree more with that saying. 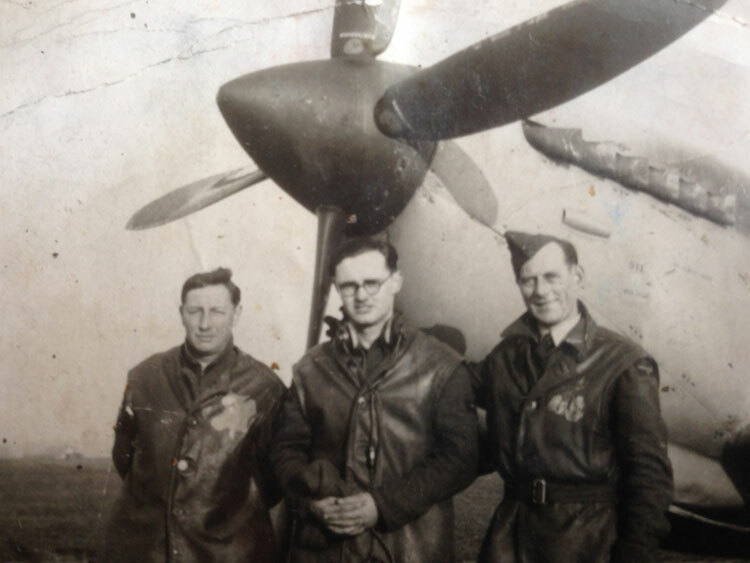 Going back to my family history my grandfather (on my mother’s side) was an engineer on Spitfires during the Second World War. My grandfather, on my father’s side, decided to move the family away from East London, with substantial bombing from the blitz, to Hacton Drive, Hornchurch, Essex. This may have sounded like a good idea at the time. However, Hacton Drive, Hornchurch joined directly on to Hornchurch Airfield! Out of the frying pan, into the enemy fire! 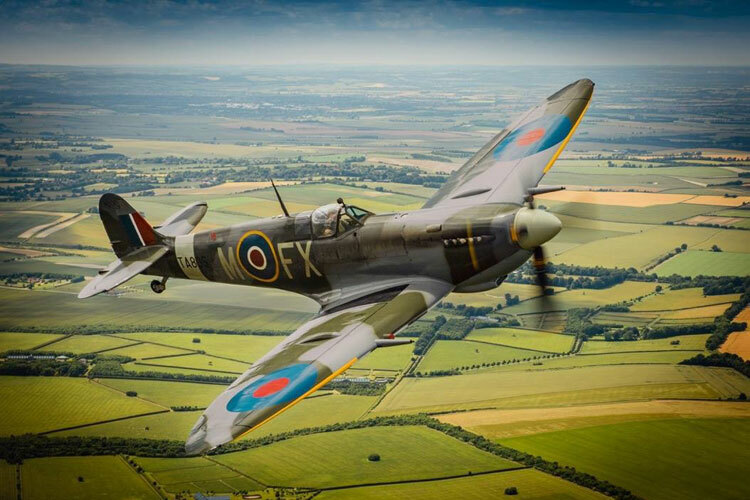 My father’s stories of growing up right underneath the aerial “dog fights” as The Battle of Britain unfolded were mesmerising. As a result I gained a passion, along with my brother, of the military aircraft of that era. I can even determine the sound of a Rolls Royce Merlin engine (the engine of the Spitfire) today. 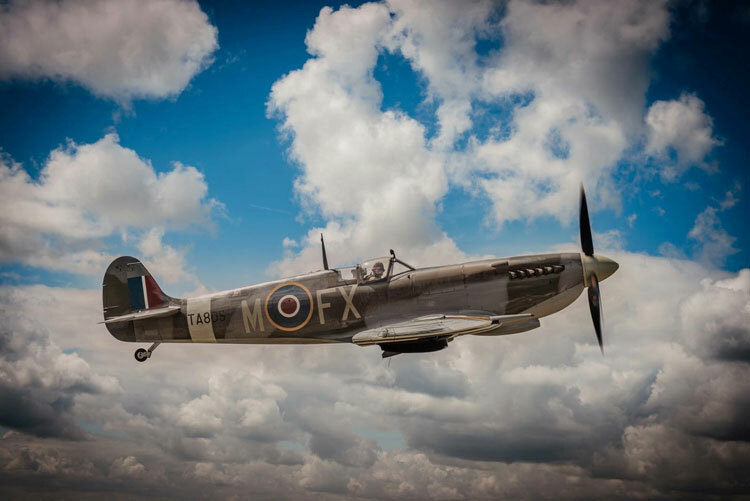 Photographing a Spitfire in the air! So, you can imagine my delight when I received the opportunity to fly alongside and photograph a Spitfire in the air! After weeks of bad weather leading up to my fight, I was delighted when, on the day of my flight, I woke up to sunny and dry weather. I drove up the M11 towards Duxford Airfield with the same excitement and anticipation that I had as a boy when on my way to an air show. Taking with me enough camera equipment fill Dixons, I was leaving nothing to chance. This was going to be a photoshoot to remember. On arriving at the 1940’s debrief building, I climbed the stairs that hundreds of air crew had trod all those years ago. Being greeted by the staff at Duxford, I was told that I only needed my camera and a short focal length lens. I was pleased as this meant that the Spitfire was going to be very close. Now I was getting very excited! I could see the Spitfire (Mark Nine) waiting patiently for me on the grass, just outside our building. I could also see the aircraft that I was going to photograph from, that was a treat in itself as it was an old Bi-Plane from the 1930’s, a Dragon Rapide. 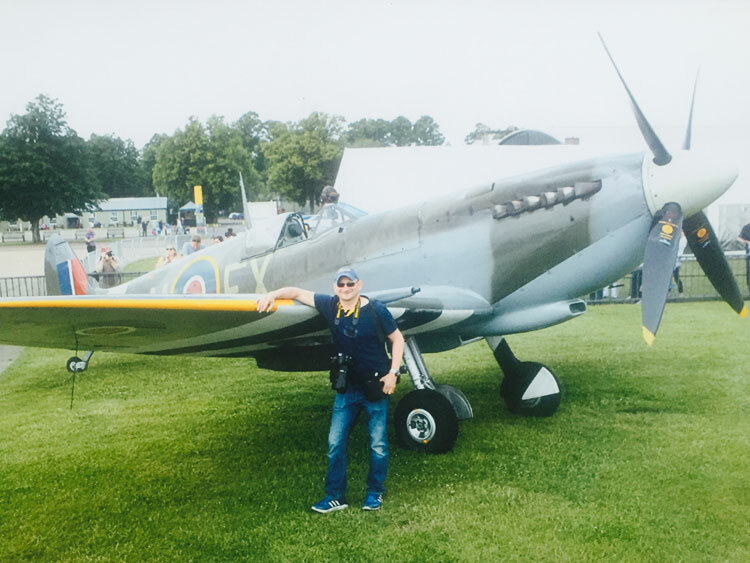 After a quick pose by the front of the Spitfire to have my photograph taken, I climbed aboard the Rapide and sat at the back where there was a sliding window from where I would poke my lens through. We took off and as the ground fell away, I double, triple and quadruple checked my camera, put on my polarising filter and looked out for what was going to be, one of the best days of my life! Then it happened. Slowly and majestically, the Spitfire crept up from behind my left. It was surreal. When you see this formidable machine in the air from another aircraft, it comes alive. For a few seconds I was mesmerised and did not want to take a picture, just enjoy the moment. Then it was time to go to work. Opening the sliding window, not worrying about messing up my hair, I proceeded to fire my trigger at the Spit. The clouds were breaking against a perfect blue sky, giving me a backdrop that could not have been better! The spitfire flew alongside for about five minutes and then slowly went under our aircraft and popped up the other side on my right. The pilot knew exactly what he was doing and gave me every angle I needed. I thought I had a great profession, but at that moment I wanted to job swap! The pilot went back and forth under our plane to make sure I got the pics I wanted. I knew I had the shots so I put the camera down, restyled my hair and just watched the moment, in awe. 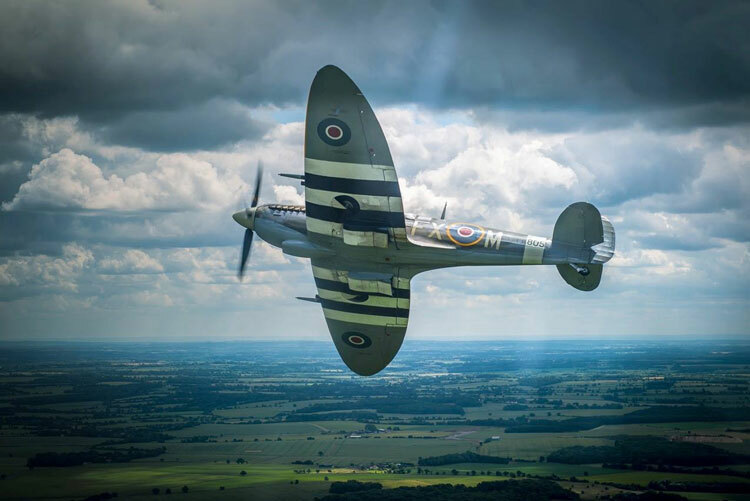 After about thirty minutes, the Spitfire banked off to my right giving me a fantastic send-off angle, displaying the “invasion stripes” from underneath those unmistakable elliptical wings. I couldn’t wait to get back down and upload my images to my laptop and start working. Back in the debrief room, I edited and selected my shots. Normally I can edit with ease, but now I wanted every shot I took! Duxford were delighted with my pictures, but I can only take half the credit as divine intervention seemed to be on my side with that perfect backdrop and weather. If things were not good enough, Geoffrey Wellum DFC, the youngest Spitfire pilot in The Battle of Britain and author of the book “First Light”, loved my images and wants signed copies from me! He has also agreed to sign copies himself of my photos of the Spitfire for me to auction off for various charities.